A Fine French 19th-20th Century Gilt-Bronze (Ormolu) Mounted, Mahogany and Tulipwood Marquetry Gueridon (Side) Table with Marble Top, Attributed to François Linke (1855-1946). The inset ovoid brocatelle d'Espagne marble top above a lozenge parquetry frieze with foliate mounts, with a drawer to one side and raised on four cabriolet legs headed by clasps and on scrolled sabots. Circa: Paris, 1900. François Linke (1855-1946) born in Pankraz, Bohemia, is considered by many as the greatest Parisian cabinetmaker of his day, at a time when the worldwide influence of French fashion was at its height. The ancien régime has always been the greatest source of inspiration for artistic design in France and, influenced amongst others by the de Goncourt brothers, the Louis XV and Louis XVI styles were revived to wide popular appeal. During the Second Empire these styles were so eclectic that they became debased. Linke wanted to create a fresh new style and his association with the enigmatic sculptor Léon Messagé resulted in a highly original series of designs, based on the rococo style fused with the latest fashion in Paris, l’art nouveau. This style, known as le style Linke, was received with critical acclaim at the 1900 exhibition and remains popular today amongst the worldwide clientele for Linke’s exquisitely made furniture. The book, with 140,000 words of text and over 700 photographs, many previously unpublished and drawn from Linke’s own archive and private collections, has ten chapters showing the development of this exacting and prolific man’s life work. It traces his early life and apprenticeship and his comfortable family life in Paris, culminating with the award of the Légion d’honneur. Appendices on Metalwork and Wood add to the technical expertise of this book, giving a unique insight into the workings of any cabinetmakers recorded to date. 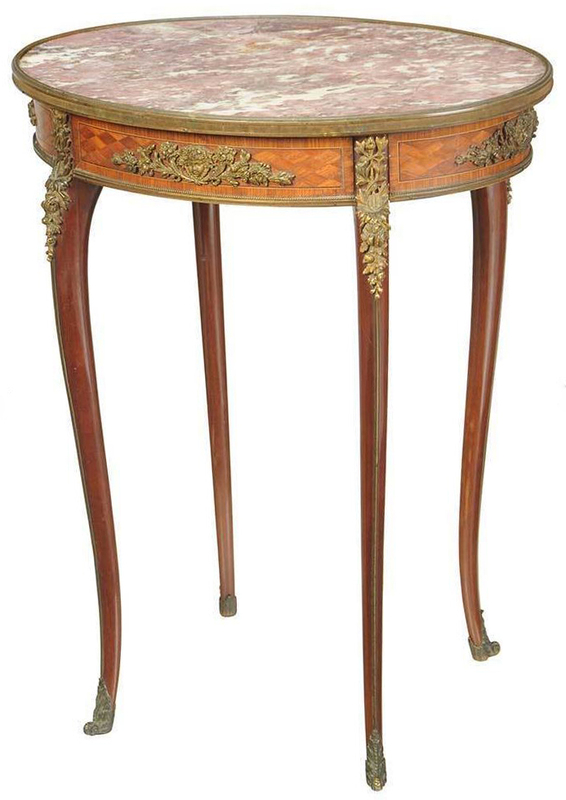 A Fine French 19th-20th Century Gilt-Bronze (Ormolu) Mounted, Mahogany and Tulipwood Marquetry Gueridon (Side) Table with Marble Top, Attributed to François Linke (1855-1946). The inset ovoid brocatelle d'Espagne marble top above a lozenge parquetry frieze with foliate mounts, with a drawer to one side and raised on four cabriolet legs headed by clasps and on scrolled sabots. Circa: Paris, 1900.